I recently shared the above image on Facebook as a way to tell any new readers I met at Sasquan how to best support my writing and make it possible for me to keep publishing books for them. I thought I’d go into more detail here. This might seem like a no-brainer, but it can get more complicated than that. I know of many indie authors whose books have been illegally downloaded many more times than they’ve been sold. My books occasionally pop up on illegal file-sharing sites, too. This is always a huge disappointment to me—because even though I write for the love of it, I also need the income that my writing provides. If you download books illegally, you’re not a fan. You’re a thief. Please support your favorite authors by legally purchasing their books and encouraging your friends to do the same! Leave a review wherever you purchased your copy and on Goodreads. If you have a blog, post your review there, too. Reviews help readers find new books, so authors are grateful for each and every one. A review doesn’t have to be very long. Just a paragraph or two describing what you liked about the book is perfect and can have a big impact. The next time you enjoy a book, take a few minutes to write a short review. The author will love you for it! How often have you read a book, watched a movie or tried a TV show because a friend of yours had been raving about it? Word of mouth can be an incredibly powerful marketing tool. If you like a book, recommend it to a friend—and encourage them to leave a review when they’re done! Post about the book on Facebook, Twitter and your blog. And that’s all there is to it! 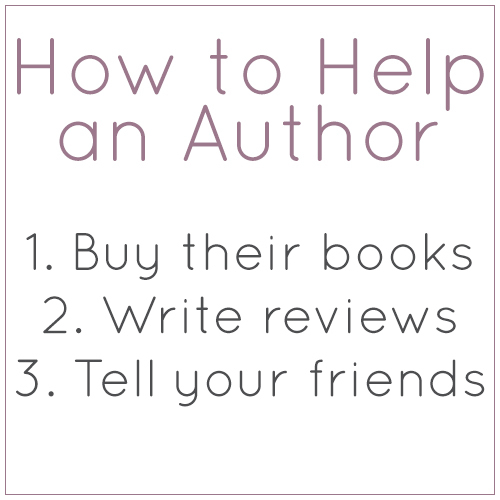 Those three simple steps are the most important ways to support authors. Pretty quick and painless, right?